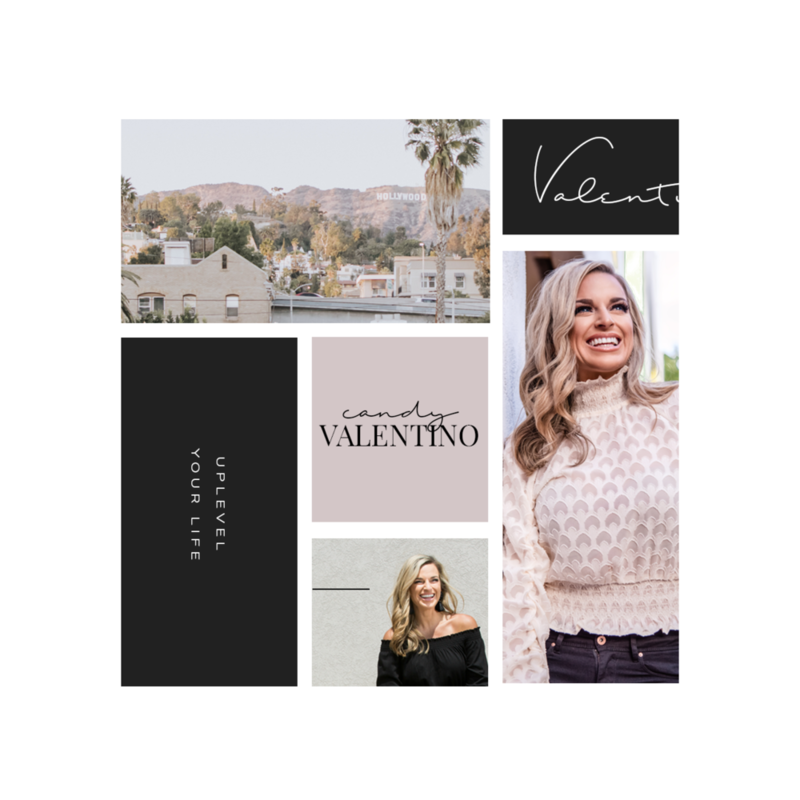 Candy Valentino is an entrepreneur and philanthropist with a huge passion for making a difference in the world and helping others see their potential. She offers a mastermind, business courses, and success coaching to help others make a living AND an impact! Amazing, right?! Our Aligned Template was the perfect base for Candy's Restyle - it's a design crafted for corporate/ small businesses and coaches. Her vision was for the site was to have a clean, inviting, and modern feel. 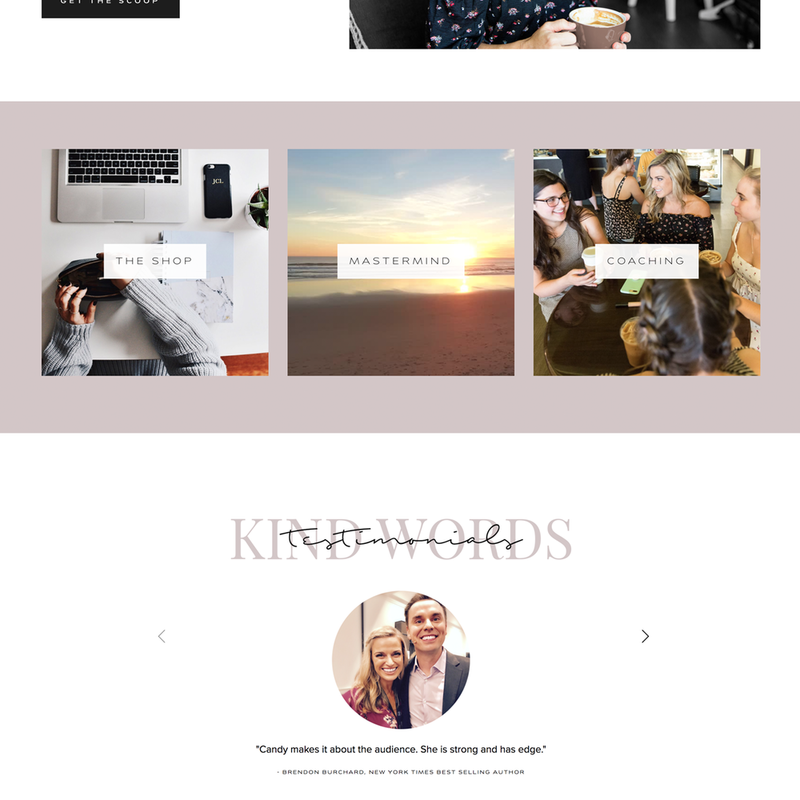 We achieved that through pairing her bright photos with a subdued color palette, and optimizing white space throughout the site. Candy's logo was one of our favorite aspects of the design - we combined a serif font and a script font for a look that defines her brand. We're so inspired by Candy's passion and love the advice she gives— don't wait to start. Just do it! "Stop wishing, wanting or waiting for someone to give you permission to step into who you want to be. Listen to the calling in your heart. You already have all the answers you need." GO LIVE: WHERE DID YOUR PASSION FOR THE INDSTURY OR CRAFT START? CANDY: I have been an entrepreneur since I was 8 and in business my entire life. My first "real" business was at 19 and I've been hooked ever since. My success in business enabled me to start my non-profit organization. My passion to help animals was something I was born with. After 20 years in business and 12 years leading a non-profit, I wanted to help others do the same by creating programs and courses to save money and, ultimately, a lot of time. CANDY: Business is literally in blood. Most kids learn or play a hobby or sports while they are in school. For me, I was dropped off everyday after school at my dad's business. I was there most nights until the evening as I answered phones, typed invoices (on a TYPEWRITER! HA!) and talked with customers. Starting a business at 19 didn't seem out of the ordinary as I'd been learning the ropes since 1st grade. I truly feel that everything I have done to this point in my life is because of two things: 1. I wasn't afraid to start something without having all the answers and 2. I believe in the ability to always figure it out. CANDY: I believe every lesson, regardless of its difficulty, is FOR us. Each of them is presented to teach us something. With that said, I think one of the toughest things I have experienced was understanding that there are a number of people that would rather see you fail than succeed. Because of my abundance mentality, I have had a really hard time understanding that not everyone is supportive and encouraging. The fact that people will judge or criticize you because you are trying to change or better your life just never made sense in my mind. I had to learn to become immune to the noise of those opinions. Otherwise, we'll end up living a life of mediocrity being controlled by the limitations of someone else's beliefs. CANDY: I was fortunate to have already begun immersing myself in personal development and mindset training. That is so pivotal to creating the life you want to live. One thing I wished I would have learned earlier would be the importance of surrounding yourself with as many mentors, teachers and people that are doing it bigger and better than you. Just get in the room. You can do it alone (I know because I did), but the rate of growth and acceleration is so much greater when you can lock arms and be in the room with others on the same path. CANDY: I don't have a "should" button. My switches tend to fire quickly. I will get an idea and start implementation. For me it's just about finding the time to make it happen. If you believe (like me) that you don't need all the answers, and you don't need to know all the steps, there's no reason to wait to start! Just start! People (women especially) tend to overthink, overanalyze, and get too many opinions. It wastes so much time and energy. You can adjust, tweak or even quit if it doesn't make sense to continue, but just start already. CANDY: My goal in life is two fold - to help 1,000,000 people step into their purpose and the life they were created to live, and to save the lives of 1,000,000 animals along the way. I want to inspire the world to live with more kindness, more compassion and leave a legacy of contribution. I believe that's why we are all here. To give, to grow and to contribute beyond ourselves.That's what I'm setting out to do. To shine light in the darkness and illuminate the path for others to see their way. CANDY: I am friends with the amazing Amber Lilyestrom and her site is almost as incredible as she is! ;) I started following you on the 'gram and loved Go Live's work. After looking into the company and sending an email, I quickly pulled the trigger. CANDY: To anyone reading this right now: You are here for a reason. You are enough. You are amazing, completely capable and have already done some incredible things in your life. Give yourself some credit. Stop wishing, wanting or waiting for someone to give you permission to step into who you want to be. You already have it. Listen to the calling in your heart. You already have all the answers you need. We only get to do this once. Follow Candy on Instagram for some serious inspiration!